Give me a heavy beachcaster and a bucket of bait and I’m a happy chappie... like tens of thousands of other shore anglers. These are my fishing roots, but there are times when I get itchy feet and want to try something that is very different. I stand by the fact that to become a well rounded angler you must occasionally do something different to your everyday fishing. If you want a break from fly-fishing for example, then try for carp, and likewise for us there are fish lurking just under the surface - not way out in the breakers - that can fire our enthusiasm. 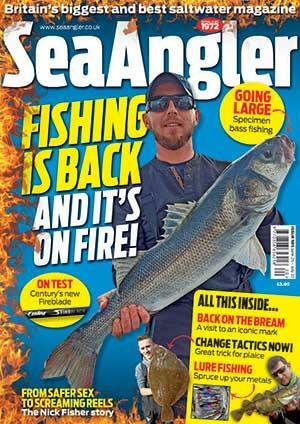 Mullet fishing is completely removed from traditional sea angling as we know it. You could argue that mullet fishing is soft sea angling with lessons learnt from the lightweight world of coarse fishing. The successful mullet angler would ideally like to have the knowledge of tides and weather from sea fishing, the stalking abilities of the game angler and the skill to handle light tackle more familiar to those on the river bank. One myth we ought to clear up is that mullet aren’t just summer fish. They forage up estuaries, waterways and harbours for most of the year. I would put my head on the block and say that the warmest months can be the hardest time to hook a mullet, although the chances of catching one depends on where you live and the mildness of the winter. Around the South West, where I live, recent winters have been so mild that you could realistically have targeted mullet nearly all year. There are times when mullet are easy to catch, but this is rare, and I would agree that the fish deserves the reputation of being difficult to catch. But if you put a little time and effort into learning more about the species then your catch rate will definitely increase. Firstly, put aside the heavy gear and enter the subtle world of estuary mullet. A flooding tide will often push shoals of mullet up an estuary in search of food and your job is to work out the places to ambush them. Success at mullet fishing will often come to legwork. You have to walk the bank, with binoculars in hand and Polaroid glasses protecting eyes from surface glare, to search for the fish. Waders could also be useful. Take a look along the edges of creeks that feed off the main river, for this is where the shoals often lurk. They are fish of habit, so once you locate their favourite haunts you will probably find them there tide after tide. Remember that if there is colour in the water and you can’t see fish that doesn’t always mean they are not there. Then again, if there is a massive amount of rainwater in the estuary it can push fish back down towards the sea. Until somebody shows me a better rod, I still reckon the Daiwa Porky Pig, a light leger/feeder, is the best tool available and most mullet anglers I know around Plymouth swear by it. It is not very expensive and ideal for mixed duties, including legering, floatfishing, surface fishing and freelining. As for reels, it’s up to you whether you spend a lot of money on a top-of-the-range Shimano fixed-spool or go for a less expensive Okuma - they will both do the job. I am not sure of the best way to go, but the main thing is the reel must have a tapered spool, great line lay and a very smooth drag. I prefer dark coloured lines like Ultima Xtra in around 6-10lb breaking strains for mainline and traces. In my bum-bag also go my hooks - try Drennan Boilie hooks in sizes 6-10 - swivels, different types of floats, leads and other tricks of the trade. Have rod, will travel... get out there and take a look around. Gauge the way you fish to what the mullet seem to be doing and remember that while they may not be feeding then, they have to eat sometime in the day. Use buckets of groundbait if you feel the need, but simply breaking up sliced white bread and throwing it in is often all that is needed. Do not overfeed the fish and try to keep things simple. If you can see fish keen on taking bread from the surface - this happens especially around first and last light - then obviously it makes sense to put on a bubble float or carp controller and get in among them, but do not strike until you feel or see the rod tip go right over. By all means trot a float down to fish that you cannot cast to effectively. This is the beauty of float fishing because it enables you to get into the middle of some fish, often without them realising, using what are really stealth tactics. Legering is my favoured method for a lot of places, although the most exciting way to catch them is by floating a bit of bread in front of their noses at dawn. Light legering can work almost anywhere and is simplicity in the extreme, but do not be tempted to strike every tremble on the rod tip. Admittedly this can be hard when the tip is bouncing all over the place when fish keep nibbling at the bread, but try to control your instincts until you get that classic slam-over bite. Mullet fishing is a potentially huge and addictive way of fishing and I just hope this encourages you to set aside your long rods for something lighter. Even if you can’t catch the blighters, you get a great kick out of watching the long torpedo-shaped shadows slowly finning up to your bait, nicking a bit of the bread and then turning away. At times it can make you feel like slinging your kit in the water.